I'm reading this book for school, and I admit to quite liking it. 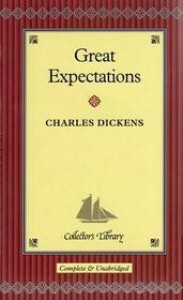 My favourite Dickens novel is 'A Tale of Two Cities', and whilst for me 'Great Expectations' didn't quite have the same impact it was still surpisingly easy to read.My only problem was that I found the protaganist, Pip, through whose eyes we hear the story, rather irritating. And the book didn't get truely interesting until the last third, after Pip's benefactor is revealed.